Hey guys! My name is Katelyn and I’m an old friend of Frannie’s! I am super excited to create a guest post for her awesome blog. 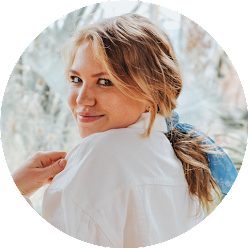 Today I wanted to share with you some of the ultimate spring fashions that I’m extremely looking forward to styling this spring. To me, spring is the best of the best when it comes to fashion seasons because it incorporates all of my favorite colors: mint, aqua, coral and navy. The trends this year are so cute and I’m loving what I’m seeing in stores. Without further ado, here are some of the trends that I’m seeing in shops lately and what I’m looking forward to rocking this spring! 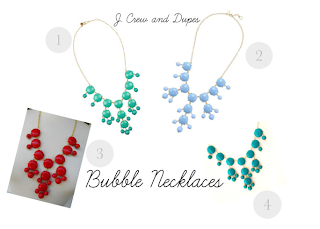 Bubble necklaces are extremely popular this spring and I’m loving them. They were first introduced in J. Crew I think last spring/summer, but now have caught on to other jewelers and are much more affordable this way. The one pictured above from J. Crew retails at $150 which is a bit pricey for a statement necklace that I would not wear every day. But, luckily other places have been creating their own knock offs for this adorable necklace. These necklaces are all over Etsy so keep an eye out! I’ve also seen a few of these at Charming Charlie’s that were reasonably priced. These necklaces come in a spectrum of colors and are very cute to spice up a basic outfit. I’ve loved colored pants ever since they first took trend, and I love that they have stayed in style for so long. 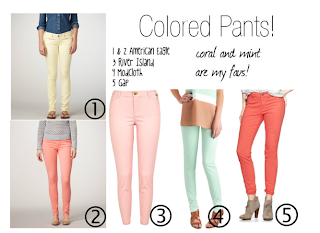 Again, this spring colored pants are in! I’m absolutely loving all of these American Eagle pants and I’ve been on the hunt for some coral ones. They have absolutely adorable coral pants from Gap and American Eagle-- double whammy! I’ve also been on the lookout for a cute pair of mint jeans because mint is one of my favorite colors. I’m loving this pair from ModCloth! 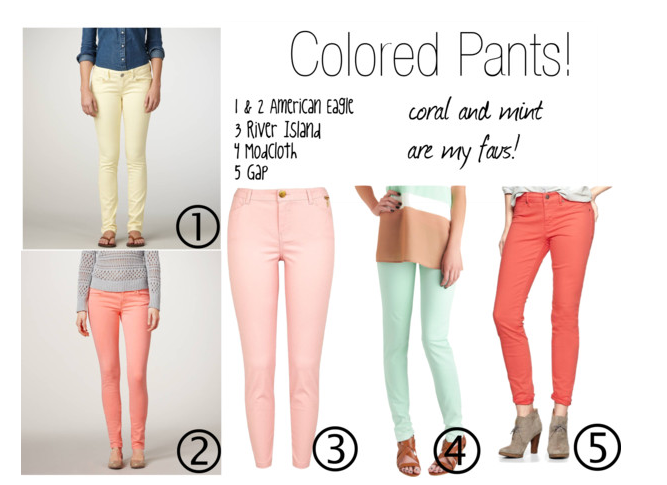 I will definitely be purchasing some colored jeans for this spring because they are super cute and so versatile. And the color of the pants can brighten anyones day! During the spring and summer I live in Sperry’s because they are the most comfortable and versatile shoes ever. I love the nautical accents on #5 because I’m so into anchors and lighthouses and anything nautical! I am loving coral flats this spring and am really eager to pick up a pair. I really like this pair from American Eagle (#1), but I’m really looking for a patent pair of coral flats. 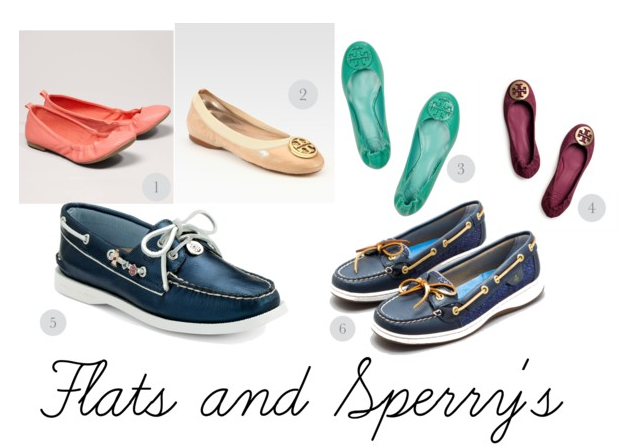 I’m also loving Tory Burch flats, but who really doesn’t! I wish they were a little bit cheaper, just because there are so many pairs that I would love to have. I only have the black ones with the gold symbols, but I don’t think I’ll be wearing my Tory Burch flats too much in the summer, but in the spring I’ll definitely be rocking them with colored jeans and even shorts. I think that flats and Sperry’s this spring/summer season will be the most worn shoes of mine, along with strappy sandals! I am absolutely loving the 3’’ chino shorts form J. Crew this year. The colors are so bright and fun and I cannot wait to get my hands on them. I am totally loving the blue shorts with the anchors on them. I truly need to buy these because they are thebomb.com! Although $60 is a bit much to be spending on one pair of shorts, they’re worth it. The other 3’’ chino shorts retail at $45, unless on a sale, but I think the shorts are great quality and highly pigmented in their color. I don’t own any chino shorts myself, but my friends do and they absolutely love them. Last year I did snag a pair of coral shorts from Target that were extremely adorable so check out Target this spring for some lower priced colored shorts! 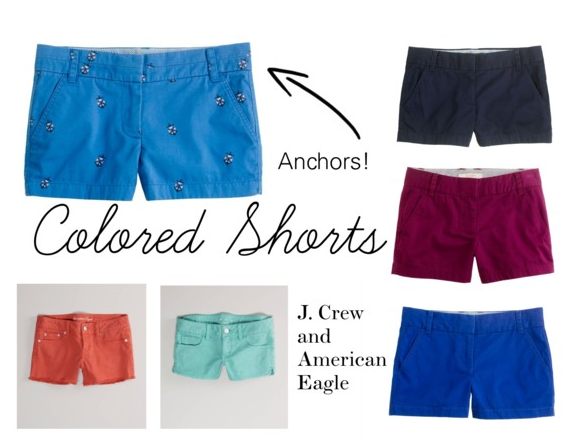 American Eagle also is stocked up on colored shorts in two of my favorite colors: aqua and coral! I think that these shorts are really cute with their cutoff look. I’m so pumped to purchase some of these colored shorts for this spring! This makeup is exactly what I would use in an everyday spring/summer look. I don’t own the Tarte lipstains, but hopefully will purchase them soon. Products #1 and #2 are perfect for an everyday neutral eye. I love using these products to get a simple, yet classic eye look. For summer/spring, neutral eyes are a simple, complete look. The Covergirl colorful palette is fun to use if you want a pop of color. I like to take an eyeliner brush and apply a little bit of the turquoise color on my lower lash line for a subtle, yet bright pop of color. I love the look because it really brings out the blue in my eyes! The Maybelline dream bouncy blush is so much fun to use because it literally bounces! It gives a nice coral flush to my cheeks and I think it gives a romantic feel to the look. The mascara is my favorite: Covergirl LashBlash Volume. I love the mascara because it gives a perfect distribution of mascara to all of my eyelashes, and doesn’t clump to the extreme. Also, it isn’t too dramatic of a look for my eyes. The Tarte lipstains I do not own yet, but I have tried them out before. They give a very natural look and a pop of color. They are extremely moisturizing and give a nice minty feel to your lips. I really like this product and I think I am going to purchase the product in the color Joy which is a peachy coral color--can you tell I like coral? Thanks for reading! Leave a comment below telling me what you think and what your favorite spring trends are and what you are excited to rock this spring!